This Blog is going to be a little different from my other blogs. Purely because I write this blog with a level of hesitation. 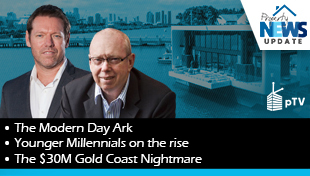 And the reason for this hesitation is because whenever I see a blog written with the title “Top Hotspots for 2019” or “Property Investment Hotspots” it usually makes me cringe. So let me preface by saying….this is NOT one of those blogs. You see, being a property strategist at Metropole means that I must approach every client’s position not only strategically but individually. Every client has unique circumstances, goals and aspirations and there is never a blanket approach to investing. Furthermore, I don’t believe in hotspots or investing in an area just because it is expected to be the “Next Best Thing”. “Hot-spots” tend to soon become “not-spots” and I’m a long-term investor, meaning I take calculated risks - I don’t speculate or gamble. 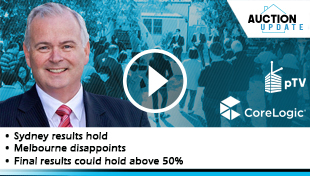 Therefore, providing a macro strategy about the Top Sydney suburbs for 2019 is not as easy as it sounds. 1. 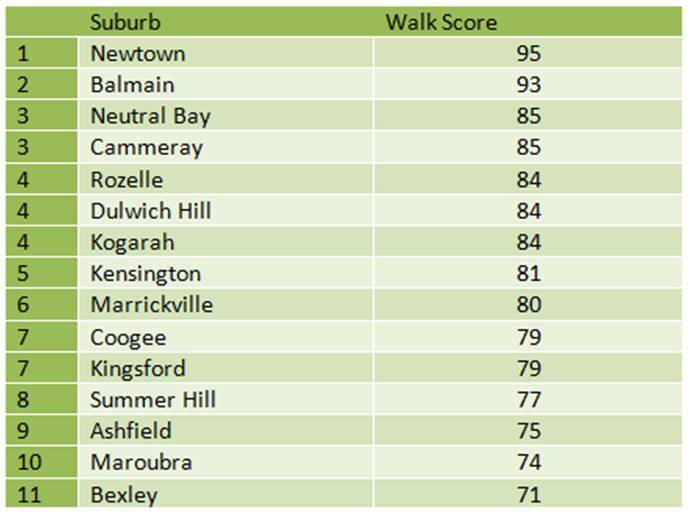 The suburbs I have featured have all been strong and stable suburbs that have both shown consistent historical growth but also have the right demographics to suggest future long term growth. 2. The suburbs I feature are all located within the inner or middle rings of Sydney so that we can avoid any hot spotting or speculative investing. These are all proven investment grade suburbs. 3. 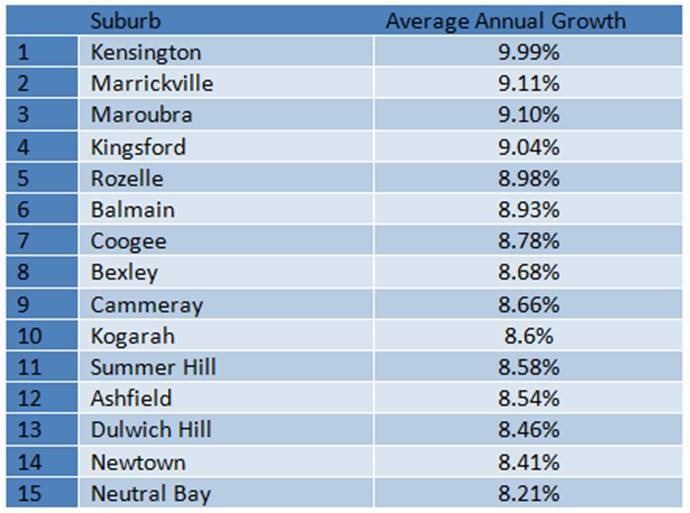 Yes, there are some suburbs outside of this list that have shown higher short term growth but the suburbs listed are long term performers based on a number of metrics intended for safe and long term growth not a short term and risky “get rich quick” approach. 4. Every client I see may be provided with a different recommendation based on their circumstances and personal goals. 5. Average annual growth is taken over a 10 year period and expressed as a per-annum figure. 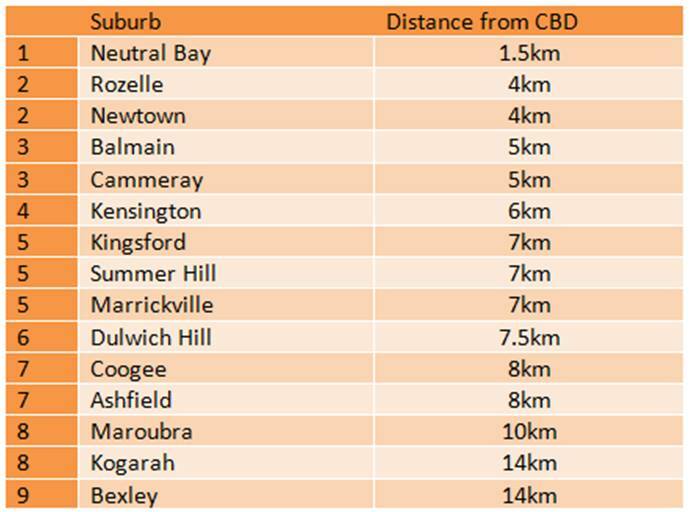 This figure may differ depending on property type as well as location within the suburb. Now that all that is out of the way….let’s get into it. This list will serve as a useful guide for investing in Sydney in 2019 - for long term growth as an experienced investor. This list will also help you avoid making any costly mistakes. Now that I think of it, I feel like I am giving away quite a bit of intellectual property with this list however if it adds value than I have achieved my goal. • It has doubled in value in less than 9 years on average and is likely to continue to do so . • Exceeds the Australian median household income of $1164.60, suggesting they all have above average household and disposable income. 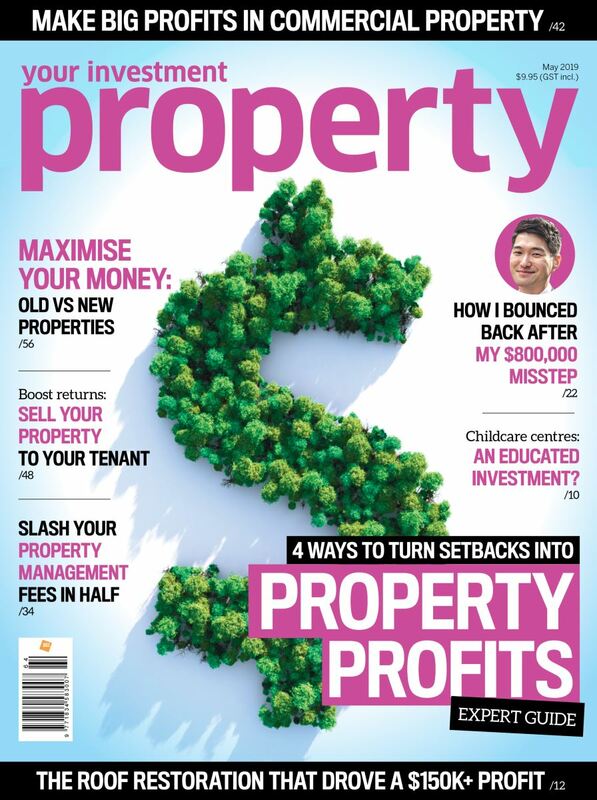 One last caveat before we get started – while location does the heavy lifting in your investment property’s performance, owning the right property in that location is critical – meaning you can’t just buy any property in these suburbs. 15 Investment Grade Sydney suburbs with heaps of upside potential. These are in no particular order, however I have provided a ranking based on a number of metrics towards the end of the blog. Ashfield is a suburb in the Inner West of Sydney and located south-west of Sydney CBD is relatively high for Australia, with the majority of the area's dwellings being a mixture of mainly post-war low-rise apartments and federation-era detached houses. Amongst these are a number of grand Victorian buildings that offer a hint of Ashfield's rich cultural heritage. Balmain is an affluent neighbourhood west of Sydney CBD with a trendy restaurant scene. Relaxed pubs and cafes occupy Victorian buildings on Darling Street, alongside boutique stores, artisan bakeries and happening eateries. Well-heeled families, artists and media figures reside in the restored sandstone workers’ cottages lining the leafy streets and stalls at Saturday’s Balmain Markets sell organic food, crafts and fashion. Bexley is a suburb in southern Sydney located south of the Sydney CBD in the local government area of the Bayside Council and is part of the St George area. Bexley contains a mixture of residential, commercial and light industrial developments and its main shopping strip (usually known as the 'Bexley Shopping Centre') is located on Forest Road. Cammeray is a suburb on the lower North Shore of Sydney and located North of Sydney CBD. The majority of residences are in the form of stand-alone or semi-detached, single or double-storey houses. Many of the quieter streets are lined with trees and have nature strips. This gives Cammeray a pleasant green look. Coogee is a gentrified coastal suburb South-East of Sydney CBD which will see the benefits of infrastructure projects over 2019. The South-East Light Rail project is a $2.2B project due to be completed in 2019 and will see a 12km light rail network connect Circular Quay to Kingsford. In addition to the light rail a $5M upgrade of the Coogee Bay Road town centre commenced in September 2018. Dulwich Hill is a suburb in the Inner West of Sydney, located south-west of the Sydney CBD. Dulwich Hill stretches south to the shore of the Cooks River and is an established residential area with many examples of federation Architecture. The streets are wider than many inner-city suburbs and houses are bigger than some older, neighbouring suburbs such as Petersham. Kensington is located South-East of Sydney CBD in the local government area of the City Of Randwick. Kensington lies to the immediate south of Moore Park and west of Randwick Racecourse. The principal landmarks of the suburb are the main campus of the University of New South Wales, National Institute of Dramatic Arts (NIDA) and the exclusive Australia Golf Club. Kensington will also benefit from the South-east light rail project. Kingsford is a residential suburb, South East of Sydney CBD and situated directly south of the University of New South Wales. It has cultural amenities along Anzac Parade and Gardners Road and is less than 5 km from Coogee Beach. Kingsford will also benefit from the South-East light rail project with a direct connection to the CBD. Kogarah is a residential suburb of southern Sydney located south of the Sydney CBD and is considered to be the centre of the St George area. Kogarah's main shopping area is located around Kogarah railway station on Railway Parade, Regent Street and on the opposite side of the railway line on Station Street. Maroubra is a beachside suburb in the Eastern Suburbs of Sydney and located South-East of Sydney CBD. Maroubra is the largest suburb in the area governed by Randwick City Council in both area and population. Marrickville is a gentrified suburb in the Inner West of Sydney and located south-west of the Sydney CBD. It is the largest suburb in the inner-west and sits on the northern bank of the Cooks River. It is a diverse suburb consisting of both low and medium density residential, commercial and light industrial areas. Many Marrickville homes are detached or terraced Victorian houses built in the late 19th century while many others were built in the Federation style in the early 20th century. Neutral Bay is a harbourside suburb on the Lower North Shore of Sydney. It is north of Sydney CBD in the local government area of North Sydney Council. Surrounding suburbs include Cammeray, Milsons Point and Cremorne. Newtown is a diverse, bohemian neighbourhood that bustles with activity day and night. Shoppers head to King Street’s indie bookshops and thrift stores. Hip bars and eateries with multicultural fare cater to locals and University of Sydney students and The Enmore Theatre hosts comedy revues and live music. Restored Victorian buildings and street art, including a mural of Martin Luther King, round out the scene. Rozelle is a gentrified residential suburb in the inner-west of Sydney CBD. Strong in cultural amenities with cafes and restaurants along Darling Street, it is a destination suburb due to its boutique stores and eateries. Summer Hill is a residential suburb located west of Sydney CBD with surrounding suburbs being Lewisham, Haberfield and Ashfield. Summer Hill has a mix of Federation-era houses, with medium density apartment blocks near the railway station. The local council has defined a village character for the suburb. Summer Hill is a suburb rich in heritage with more than one hundred properties being heritage listed. As I’ve already mentioned, it’s important to understand that location accounts for up to 80% of a property’s performance and the other 20% or so comes from the property itself. Meaning that with correct location and property selection you can find an investment grade asset that well and truly outperforms the averages in growth. 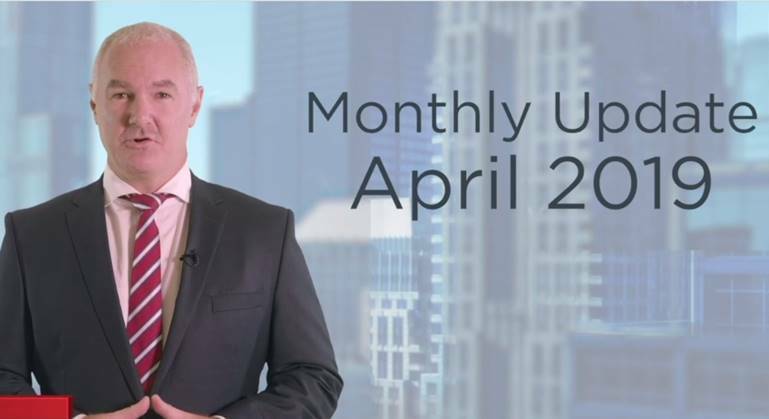 If you would like assistance in finding an investment grade asset in Sydney that outperforms the averages in growth, give the Metropole Sydney team a call on 1300 METROPOLE or click here and leave your details. Ahmad Imam is a director of Metropole Properties in Sydney, is a highly skilled wealth strategist and a passionate property investor. 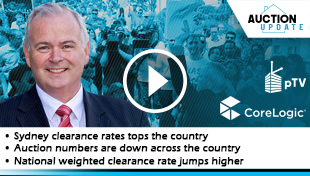 He has a degree in Commerce, is a licensed estate agent in both NSW and QLD and has personally coached and educated hundreds of clients to create wealth through property.